Welcome to Sandcastle Dreams, Edgewater 104T2! 'Smack Dab on The Beach' and Gulf Front Too!! Our 1st floor condo is in the Edgewater Beach and Golf Resort Tower 2 with a panoramic view of the Majestic Gulf of Mexico. Emerald green waters, sugar white sands, most beautiful sunsets anywhere, picturesque views ranging from parasailing to just plain sky and water. Comfortably sleeps up to 4, two in the king-sized bed and 2 on the queen sleeper sofa with gel mattress and 2 bathrooms for added convenience! Emerald Beach Properties welcomes you to Edgewater, your Perfect Place in Paradise! As soon as you open the front door to your dream vacation, you will be welcomed by the captivating Gulf of Mexico view from the floor to ceiling windows and access to your spacious private balcony! With over 1000 square feet of living space, and another 119 square feet on the balcony to enjoy, this is the ultimate hideaway to catch up on some rest and relaxation! The chairs and tables on your private balcony are so relaxing, you'll enjoy beautiful sunrises and exquisite sunsets here. The roomy “Tropical Oasis” master bedroom is Gulf-front, and offers a comfy king size bed, charming seating nook to enjoy a good book or simply enjoy the outstanding ocean front view, 32' flat screen television with cable, and its own balcony access. The en-suite master bathroom includes an enormous Jacuzzi jetted soaking tub, large vanity area, and fully tiled walk-in shower. Top to bottom indulgence! The expansive great room has a tropically inspired queen sleeper sofa, loveseat & man sized leather recliner and 50” LCD television with cable services, stereo system, DVD player, and access to your private balcony, everything you need to feel right at home, plus more! We call the second bathroom the Sandy Beaches bathroom because it's cheerfully decorated in a beachy style. This is a great feature of this deluxe floor plan that makes it easy for everyone to get ready when it's time to go out to the beach or other fun activities. The open floor plan has plenty of space and an unobstructed view of the ocean. You have spectacular views from the great room, the dining area and kitchen. The dining area has seating for 4 and additional seating at the bar. Your well equipped kitchen offers a Gulf view of its very own, upgraded cabinets, granite countertops, major appliances, and all of the small appliances you'll need, including a Keurig machine. Cooking utensils, dishes, glassware, flatware, cookware and bakeware are all provided for you to prepare everything from quick snacks to a gourmet dinner for the whole family! “Sandcastle Dreams” includes many amenities not found in other properties! Large stacked washer and dryer, luxury bedding, high thread count luxury bed linens, fluffy high quality bathroom towels, kitchen towels, and extra blankets & pillows are all chosen and provided with your comfort in mind! Free local and US long distance phone service, and “surf by the surf” with free private high speed internet access! Edgewater Beach and Golf Resort has the Amenities you are looking for!! The Polynesian-style Lagoon Pool is 11,500 square feet of pure pleasure, and there are four heated hot tubs around the pool and Gulf-side. Each Tower has its own private pool and hot tub, there are a total of 12 pools on the property. Additional amenities on site are available for an additional fee. The nine-hole, par three golf course is located near the Villas. There are 10 lighted Plexicushion tennis courts, and a complete pro-shop for equipment rental. The game room offers video games and there is volleyball on the beach. On-site services include Ocean's Bar & Grille beachfront restaurant that also offers room service and poolside dining, pizza shop, poolside bar and Edgie's beach store with Starbucks and ice cream. The resort also offers a hair salon, gift shop, health spa, massage therapy and free tram service for the entire complex. The 9-hole, par 3 golf course and tennis courts are located across the sky bridge. Contact the resort for information on pricing and availability. Everything you need is nearby or onsite! Edgewater Beach Resort offers guests the most amenities of any resort in Panama City Beach, there's something for everyone! 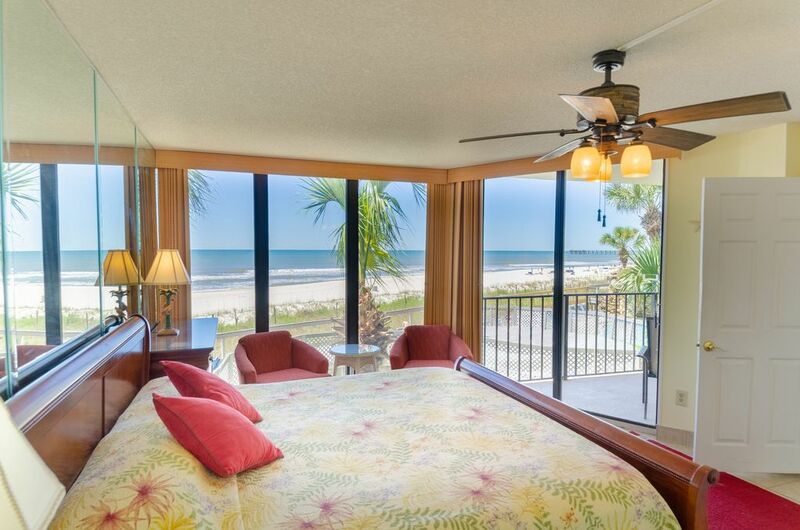 Sandcastle Dreams is an Edgewater one bedroom deluxe property. Two full bathrooms make this a really comfortable place for up to 4 guests. It is one of the most spacious one bedroom floor plans on the beach. The rooms are really large and you can see the ocean and beach from everywhere in the condo. This property is on the second floor so it is very convenient to parking if you don't like to wait for the elevators. Beautifully updated with a huge spa tub in the bedroom overlooking the hot tub and the beach! Great for a romantic get away or a fun family vacation. From the master bedroom, great room and balcony! Large stretch of private beach for our guests. See the ocean from everywhere in this condo. Both bathrooms have hair dryers. Queen sleeper sofa, man sized TV, leather recliner and more. 2- Living room has 50", bedroom has 32" flat screen. Offered by resort on site. See beach kiosk for beach chair rentals and other toys. Main pool is heated in cool months. Call Emerald Beach Properties for concierge services. This condo is super cheerful with beach kitsch everywhere. We called and texted the rental management company with a question when we arrived...never received a call or message back. The sliding door in the LR doesn't lock and with this being a "first floor" unit, that was unsettling until we found the wooden rod to block the track. We were not expecting the spa tub right in the master bedroom but others might like it. Just a little tired and beat up throughout. Loved the room and the jacuzzi tub! We had such a great time. The room was clean and nicely furnished. The patio view was amazing!! We will definitely be back!!! Nice condo with great view of ocean! We enjoyed our stay at this property!! Our condo was very nice and close to the pool. Loved being able to see the ocean from every window!!! Thank you for your review and staying with Emerald Beach Properties! We are glad you had a great vacation and looking forward to your return. Would have been perfect except for smoking guests. Wonderful condo! Beautiful resort! The pools had waterfalls and landscaping that we really loved. The dive in movies were fun and the snack stand was convenient. The beach did not disappoint. The location was perfect. We loved the jacuzzi tub. The only reason I did not give it 5 stars was the fact that the resort allows people to smoke off of their balconies and at pools and hot tubs. I absolutely can not tolerate smoking as it gives me headaches. People staying near us smoke continuously which meant I could not enjoy our balcony with the beautiful view. They really should change this policy. For the amount of money we spent, I feel that having to deal with cigarette smoke the whole time was very unfair to us. Thank you for your review and staying with Emerald Beach Properties! We are glad you had a great vacation and looking forward to your return. We are sorry for the smoking outside, we cannot control Edgewater Property Rules. Loved every minute of it! Was here for the Ironman 70.3 Gulf Coast and this room was located right in front of the Transition Area and also had an awesome view of the beach! Thank you for your review and staying with Emerald Beach Properties! We are glad you enjoyed your vacation with us! Looking forward to you staying with us again! We really enjoyed our stay in this condo and resort overall. The condo is very clean and well furnished. It is located very close to the restaurant and lovely pool area which is convenient. The resort is very well maintained. The only reason we didn’t rate it 5 stars is the resort allows people to be in the hot tubs until midnight and there is a hot tub very close to this condo. It was quite noisy most nights until after midnight. This issue could be eliminated if the resort would change the hot tub closedown to 10:00 pm. Thank you for your review and staying with Emerald Beach Properties! We are sorry for the issues you experienced during your stay. Unfortunately Edgewater controls the rules for the property. Perhaps for your next vacation here at Panama City Beach we can help you find a different condo at Edgewater or another resort. Feel free to browse our website for accurate and up to date information. Looking forward to seeing you again.